The Scoop: Online dating is a game of first impressions. Got a hole in his T-shirt? No, thanks. Poor lighting shows bags under her eyes? Swiping left. It’s superficial and judgy, but it’s absolutely how online daters make decisions. According to a study, the average online dater spends 58 to 84 seconds on a profile, and more than half that time is spent looking the photo. Online Profile Pros is on a mission to make sure that photo shows the online dater in the best possible light. This dating photography service has established an international network of nearly 3,000 photographers who conduct private photo shoots in a studio or on location. 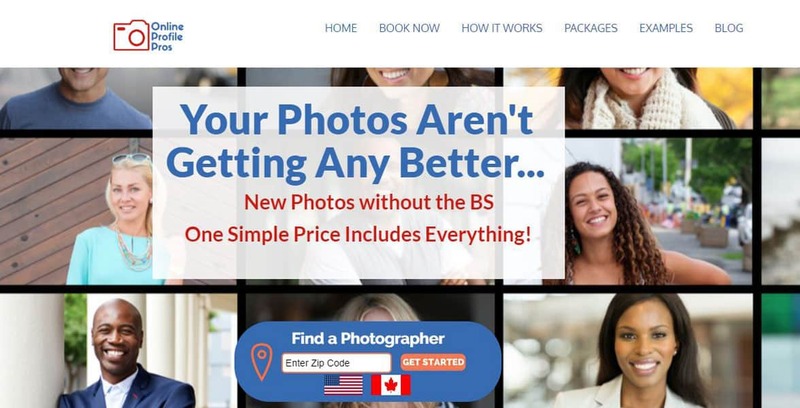 Now the company seeks to expand its services by partnering with dating professionals who can add valuable expertise to the photography packages. That way, singles don’t just get a few photos; they get an in-depth online dating makeover. Founded in 2002, Online Profile Pros (OPP) was originally named DatingHeadshots because its creative team of photographers focused on capturing attractive photos for clients to use on dating websites. Its straightforward services gave singles the chance to make a solid first impression using a carefully crafted profile picture. The company started out as a regional network of freelancers in New York City, but now it has gone international. OPP is active in 1,000 cities throughout the US and Canada with plans to expand into Europe. As the team gained expertise on dating profiles and online dating in general, it made sense for them to rebrand from DatingHeadshots to Online Profile Pros. Today, OPP is set to become an all-purpose dating profile fixer with a range of services (including profile writing, image consultations, and dating coaching) to help online daters get better and faster results. By partnering with other professional dating experts, Online Profile Pros will distinguish its photography services from its competition and grow its bottom line as customers seek more comprehensive services to meet their needs. Online Profile Pros offers profile enhancement services powered by an international network of pros. Rather than focusing on a single niche service, Online Profile Pros is broadening its services and developing affiliate relationships to address all the different issues that can hold singles back and lower their chances of making a match. What’s more, Online Profile Pros’ network has begun growing at a rapid pace to meet demand in the dating world. The company is currently recruiting knowledgeable and personable photographers around the world with the goal of adding as many as 10,000 vetted photographers to its network. Online Profile Pros recently worked alongside eHarmony to study the nuances online attraction and develop solutions for online daters not getting the traction they desire. The OPP team were privileged to get a behind-the-scenes look at the acclaimed dating site’s in-house matchmaking services, and they came away from the experience full of ideas to streamline the online dating experience. Now, OPP has begun partnering with local dating coaches and matchmakers who want to expand their client bases. The dating photography company will recommend these professional dating services at a reduced cost for current clients. Claire said clients often ask for consultations on everything from hair and makeup to dating style, and building a network of dating professionals ready to consult made sense for the company’s business model. Many singles have perfected their online image after working with Online Profile Pros. Online Profile Pros may have started out as a quick fix for online daters worried about their profile photos, but the business model has since expanded to include image consultations and a range of services designed to help clients not only look their best but be their best. The team of dating experts do everything they can to prepare single men and women to land that picture-perfect date. In the coming months, coaching and matchmaking referrals will supplement OPP’s current photography services and offer clients with serious dating challenges a more long-term solution than a one-day photo shoot. Online Profile Pros continually evolves to better serve the needs of modern daters. Since the outset, the company has set itself the task of making online dating more efficient and enjoyable, and it has collaborated with many noteworthy dating experts to further that goal. Claire told us OPP’s latest partnership is particularly exciting because it involves blending advanced technology with dating profile consultations. OPP recently partnered with one of the world’s largest artificial intelligence and facial recognition companies to give customers greater insight into what makes a particular picture succeed or fail on a dating site. The high-tech software will analyze images sent by prospective customers and offers spot-on analysis based on its unique knowledge base. The AI technology can offer a balanced look at how a person’s body language, wardrobe choices, and facial expressions in a single photo can impact how the overall profile is perceived. The program’s findings can be impactful to customers because, instead of stating platitudes or using anecdotal evidence as some dating coaches are wont to do, the program can offer hard data to back up its claims. This evidence-based approach to online dating is appealing to singles who want the unvarnished truth about how they look. Online Profile Pros began as a close-knit network of photographers in the Tri-State area, and now it has become one of the largest and most trusted dating photography services in the industry. The company’s success in transforming dating profiles with a portfolio of photos has led the team to set their sights on loftier goals and develop innovative services to give singles the best shot at getting a date online. Through its partnerships and global expansion, Online Profile Pros is positioning itself as a go-to resource for all singles hoping to upgrade their online dating experiences. Whether they need a new profile pic or an image consultation, Online Profile Pros can prepare clients to tackle dating with renewed confidence and dynamite photos. “Everyone has a personal brand, and how you treat it and nurture it has immense impact on your romantic life, career development, and social standing,” Claire said.